was a passion project for PCA chairman Mo Stein and longtime PCA President Don Keuth. The 10-acre homelessness services facility located between the downtown core and Capitol Mall, was a passion project for PCA chairman Mo Stein and longtime PCA President Don Keuth. Early in his service to PCA, Stein was named to Central Arizona Shelter Services’ board of directors and it quickly became clear to him that for CASS to effectively execute its mission and become sustainable for the long term, the addition of essential services were necessary. The shelter was overrun and Phoenix was the only Valley city stepping up to combat the serious social problem of homelessness. Stein and Keuth rallied the PCA membership to take the creation of the human services campus on as an advocacy initiative. 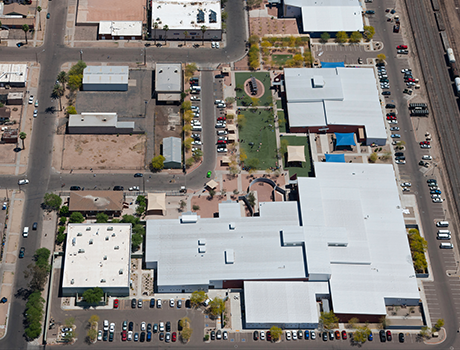 After years of work and fundraising (the project had a price tag of $25 million) by PCA and other city and business leaders, along with assistance from Maricopa County, the campus opened in 2005. The campus houses CASS and many other high profile non-profits and is the largest homeless services campus in the state.